Well, the plot thickens. SureFoot Helms came out out of his shell again with another heads-up communique to Regis and Kelly. The question is whether or not the message, of vital importance, will get their attention? Who knows? You both might need some more proof. Okay … consider your statures … both of you are close in height. And have you ever compared your noses? Regis you’re a reasonable man … okay, enough said! The problem isn’t that the aliens are amongst us. It’s the damned deception and all the games. After all there’s a lot of room on our planet but earthlings don’t like to be played. That’s where a private eye like me comes in. Here’s an alien update. The aliens are targeting not only Hollywood but also some other key industries. Here’s the proof! You’ve probably seen some of the new Burger King commercials. Three so-called “Kingons” beam on the scene. Well my investigative talents were put to good use. 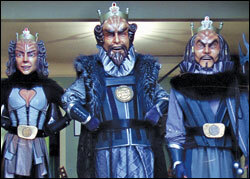 They aren’t really “Kingons” but rather they are really Klingons in disguise. Okay I'll give you one of my secrets: You see … a first principle of investigation is “don’t neglect the obvious.” I’m certain you can see the connection. Here’s another freebie. You have also probably seen the Geico commercials featuring the Gecko. He’s one of their most revered front men. The naked salamander is certainly easy on the eyes and very glib indeed! Don’t be taken in. 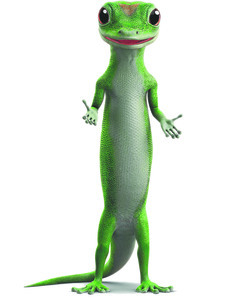 The Gecko is really an alien who worked his way up the ranks and my sources claim his mission is to dominate the insurance industry. Hey … his cousins clearly appeared in “The Men in Black” series. For some reason their kind don’t like to play dress up like humans. Also don’t be fooled by his “British” accent. This Gecko is a smart alien reptile who learned to speak English, British style. It’s part of his put on charm. So I’m still available for hire … but I don’t simply sit around eye balling my inbox or waiting for the phone to ring. I’m very much in demand … but I think my services are well worth my pricey fee.